You are currently browsing articles tagged vs. I spent a couple months writing eBook user’s guides to both the Canon 60D (Your World 60D) and the Nikon D7000 (Nikon D7000 Experience), so I’ve spent considerable time with each of these cameras and know their features and controls inside and out. Check out these ebook guides to learn more about using and photographing with these cameras including all of their Menu settings and Custom Function settings (with recommended settings) plus discussions of how, when, and why to use the cameras’ settings and features, (metering modes, aperture and shutter priority modes, advanced autofocus use, focus lock, exposure lock, and more) for everyday and travel use, to help you take better photos. Comparing their features on paper, the Canon 60D and the Nikon D7000 are incredibly similar. One model is slightly better in one area, and the other model wins out in another area. With both models, it appears that you pretty much get what you pay for. Pay a couple hundred dollars more for the D7000, and you get a camera that rewards you for that extra cost. Megapixels: Canon’s 18MP is more than the Nikon’s 16MP, which gives you slightly more cropping and enlarging ability with the 60D. To see how this affects images quality, you are going to have to look at the tests at dxomark.com. ISO performance is very similar, with the D7000 having a slight edge. And as far as color sensitivity, dynamic range, and tonal range, the sensor of the D7000 performs noticeable better. But, be aware that dxomark tests the sensors, but not in conjunction with the camera’s processor, so it is not a complete indication on the final image. A camera processes the images captured by the sensor, even when shooting in RAW, to produce optimal image quality – such as applying a bit of noise reduction, maybe tweeking the color. So it is likely that any “shortcomings” of a particular model’s sensor are addressed by that camera’s processor. ISO: You typically shouldn’t be shooting over 1600, maybe 3200 if absolutely necessary, so this is no big deal to most users. But since the megapixel race is over, ISO has become the current benchmark for comparison. It gives the pixel peepers and forum folks something to argue about. Again, check out the tests at dxomark.com to see that they show pretty similar ISO performance, with the D7000 slightly better. DPReview says the D7000 is arguably the best performing sensor for high ISO/ low noise in the consumer class (along with the Sony A55 since they have the same sensor. Did you know that little nugget? Sony manufactures sensors used by numerous other camera ). HD Video: Canon offers 60fps which I understand is very important to videographers, and Nikon doesn’t shoot 30fps or 25fps at 1080p as Canon does. Nikon offers full time autofocus which may be slow and cumbersome and thus isn’t a big deal to videographers. We will have to see how well that works – early reports say not so great. LCD screen: the articulating screen of the 60D could come in handy for several types of shooters. There are many times I could have benefited from a rotating screen such as when I was on my belly in wet grass trying to crane my neck to see through my viewfinder and capture a subject and her active dogs from grass level. Auto focus system: This is a difficult comparison. The 39 AF point system of the Nikon offers both many more AF points plus customization capabilities for how it operates and tracks moving objects that rival the 7D (see Custom Functions/Custom Settings section below). However, only 9 of those points are the more accurate cross type, while all 9 points of the 60D are cross type. The 39 point system of the Nikon might be better for situations where you let the camera choose the AF points to track motion, such as sports, action, and wildlife. But you should often otherwise be choosing the AF point yourself. So with the Nikon, you may want to limit selection to 11 points (Custom Setting a6). If you want a Canon body with a more advanced AF system than the 9 points and basic tracking of the 60D, and overall more accurate than the D7000, have a look at the incredibly advanced and customizable AF system of the 7D with 19 AF points, all cross type. Maximum burst rate: Close, but Nikon wins this one by a hair. Either rate should be fast enough for most photographer’s needs. The Nikon has the nice feature of being able to change the low speed continuous rate from between 1 to 5 fps. I had previously complained that the 7D should have had this feature since its 8 fps is often overkill. The 5.3 fps of the 60D is great, so it doesn’t really require the ability to change the fps beyond the available 3 or 5.3. Also note that the Canon will allow a continuous burst rate of 58 continuous photos in highest quality JPEG and 16 in highest quality RAW, while the Nikon is limited to a much lower 31 JPEG and 10 RAW before its buffer fills. Construction: Nikon wins this one, but Canon saves weight with its construction. And I assure you both are more than strong enough for everyday, even abusive use. That being said, the partial metal body (magnesium allow on top and rear) and rubber grip material of the Nikon has a nicer feel and is a great detail that the 60D should have had. I think it is one of the main reasons for the increased price of the D7000 over the 60D. It is worth noting that the magnesium alloy body of the D7000 does not fully extend around the front, and thus the area surrounding the lens mount, which plays quite an important role in supporting a large, heavy lens, is plastic. See this image of a D7000 skeleton next to one of a 7D for details. Kind of an ugly sight for those trying to compare the D7000 to the 7D. Important details like this demonstrate why, in the end, the D7000 just ain’t no 7D competitor. Sorry, the name of this post will just have to remain Canon 60D vs. Nikon D7000! SD Memory cards: I’m not sure the appeal of 2 memory cards in the Nikon, and why that might be better than just using one larger capacity card? Is it really useful or just a bell/ whistle? You can use the two cards of the D7000 in four ways: overflow, JPEG / RAW, backup, or stills / movies, so maybe that is kind of cool, but I actually prefer to be dealing with just one card at a time at this point. Wireless, remote flash triggering: A super-cool feature available on both cameras using the built in flash to trigger off camera flashes. Viewfinder: Nikon wins this one with slightly bigger size, though I don’t know how the actual brightness and view compares. It is a shame the 60D viewfinder view is not 99% or 100% of the actual resulting image like the Nikon. In reality, you won’t notice any shortcomings with either the 60D or the D7000 viewfinder once you start using it. The D7000 includes the option of displaying the grid in the viewfinder, which the 7D also has, and I wish the 60D did as well. Size and Weight: Not a major difference, you will have to see how they feel in your hands. Metering: They each have different metering systems, so it is difficult to compare. I’m sure they will both perform quite well. In addition to Evaluative/Matrix and Spot in both of them, the Canon has Center-Weighted and Partial, while the Nikon doesn’t have Partial but has the ability to change the size of the center area in Center-Weighted mode, which sounds pretty cool but may be more of a “set it once to your preference and forget it” thing. Depends on how quick and easy it is to access it in the menus, on the fly. Processor: This is a pretty important component in the comparison and can really help resolve if the D7000 sits closer to the 7D or the 60D. I don’t yet know enough about the performance of Canon’s Digic IV vs. Nikon’s Expeed II to comment on this. The larger maximum burst buffer of the 60D may point to a more powerful processor. However the dual Digic IV processors of the 7D are able to handle much longer bursts of many more images than the single processor of the D7000 (and the 60D) – again, another very important reason the D7000 is not actually head to head with the 7D. Custom Functions/ Custom Settings: Despite what I say below in the Controls and Menu section, the Custom Settings of the D7000 are far more sophisticated than those of the 60D, and in that respect make it much more of a contender with the Canon 7D. With the D7000, you can change the size of the center area metered in Center Weighted Metering Mode (not possible on 60D or 7D), you can change the frame rate of Continuous Low Speed between 1 and 5 frames per second (not possible on 60D or 7D), you can give buttons a “hold” feature or not, where you press and release instead of having to hold it down when turning another dial to dial-in a setting (“hold” means the camera does the holding, not you). With the D7000 you can set the autofocus tracking to be nearly as sophisticated as the 7D in terms of how to react to objects that come between you and your intended subject, and also in setting focus priority or release priority (take the picture only when focus is attained or take it immediately even without necessarily attaining focus). You can limit the number of AF points to 11 if you don’t wish to deal will all 39, you can fine-tune focus adjustment for different lenses like the 7D AF microadjustment (not possible on the 60D), plus you can fine-tune exposure adjustment for each individual exposure mode (to set a baseline compensation behind the scenes and not have to use exposure compensation every time, if you feel one of those modes is consistently over- or under-exposing). You can fine-tune the white balance for many more standard fluorescent options without having to have a Kelvin cheat sheet, as you might need to set the same temperature settings on a Canon. All very impressive, and all features that the 60D and certainly the 7D should have but don’t. Also, while I like the two rear thumb buttons of the 60D 7D for exposure and focus lock, you can set the AE-L/AF-L and Fn buttons (and preview button) of the D7000 to take on similar operations. Controls and Menus: As a Canon user, I find the controls and menus of the Canons to be incredibly practical and intuitive. As a photography instructor, I try to be open-minded about the Nikon controls, notations, and menus, but continue to find them incredibly irritating, nonsensical, and not nearly as intuitive and user-friendly as Canons. I also think that the consistency of the controls and menus across the Canon line, from the 550D to the 5D MkII points to intelligent and thoughtful design. You can pick up any model and go to work, then quickly and intuitively change the ISO setting or metering mode. On the Canons, the controls are not scatted about in seemingly random places that change dramatically from model to model. Please don’t think I’m just a Canon guy on a rant here. Have a look at the controls on the top, back, and front of the D300s vs. the D7000 – essential controls are completely different. Why is that? Functions that are switches at the rear of one are a button at the top of the other, or marked dial switches on the rear become an unlabeled button on the front. The standard dSLR mode dial completely disappears and becomes a trio of buttons on one Nikon but not the other? I challenge you to pick up a D7000 and change the AF area mode to single point AF. The first time I picked it up I searched the camera’s buttons, switches, and menus for 15 minutes and never found it. I handed it to my camera store co-worker and he failed as well! (Spoiler alert! It is done with the unmarked button located inside the Auto/ Manual focus switch near the lens mount in conjunction with a command dial.) Wait, so a switch that is C/S/M (continuous/ single/ manual) on one Nikon becomes AF/M (autofocus/ manual) on the other? So the same switch now partially controls a different function? Where are AF-C and AF-S (auto-focus continuous/ single modes) found now? Oh, who knows! (Actually, the same place as above, with the unmarked button and the other command dial.) As you can see, this is maddening to a photography instructor or salesperson who must deal with a number of different models and who is attempting to quickly demonstrate these very functions. I’m not even going to start on my feeling for Nikon menus! Keep in mind, this all doesn’t really matter if you buy and use one of these cameras- you get that one and learn its controls. But I feel it does point to an intelligent consistency on Canon’s part, and as an architect in an earlier life, I highly appreciate good design and intuitive wayfinding. And also many photographers work with two bodies which are often different models of the same brand, and the ability to switch between a Canon 50D and a 5D Mk II without skipping a beat is how it should be. You can actually forget which one you have in your hands and it doesn’t matter. But once you do learn all the controls on the body of the D7000, you have an incredible amount of control at your fingertips. edit: After much more experience with various Nikon cameras, I no longer have any issues with their menus – once you get used to the Canon or the Nikon menu system it really is no big deal. I still do think that the ability to seamlessly go from a 60D or 7D to a 5D Mk II with all the controls being the much the same is awesome (with the exception of the thumb multi-controller now becoming a pad on the 60D) and many photographers working with two bodies do this often – as opposed to going from a D90 or D7000 to a D300s, where there are some dramatic differences (which I do understand make sense in relation to the capability of the bodies, yet must aggravate those photographers working with two of these different bodies…). Price: The Nikon is $100 to $200 more than the 60D (depending on current specials), and people are saying it is a cheaper competitor to the 7D. But if you study them closely, you can see that it does actually sit between the two. While the D7000 has an advanced AF system and tremendous customizing capabilities, details like the partial vs. full magnesium body construction and the single vs. dual processors of the D7000 vs 7D demonstrate why they are not exactly head to head competitors. The D7000 definitely offers at least $200 of improvements over the 60D, if not more, and is being very well received among photo enthusiasts just as the Canon 7D was last year – you pay a bit more and you get more features. Oddly, DPReview has suggested that the pro-sumer D7000 is a viable upgrade to the Nikon D300s, a higher end, more expensive semi-pro camera. So this makes the decision a bit more complicated for the Nikon D7000 vs. D300s comparison. Quality Control: There have been numerous reports on the Internet of faulty D7000 bodies. The issues are mainly the bad pixel problem and the front/ back focusing issue. While this type of reaction seems to occur every time any new camera model comes out, there seems to be legitimacy to these complaints. My local camera store (where I worked for a time) reports that they continue to experience these issues with their customers. For the pixel peepers who insist on a clean sensor, nearly every D7000 body tested was found to have bad pixels out of the box. The firmware upgrade fixed some of cameras with bad pixels but not all of them. (What is the fix exactly? Pixel mapping?). Several pixel peeping customers also had front or back focus issues, and went through 2 or 3 bodies to find one they could accept. (see This Lens is Soft and Other Myths for an article about front/ back focus and quality control.) Also, some of the official Nikon EN-EL15 batteries are larger than others – yes physically larger – and do not properly fit or get stuck in the D7000 body. As far as Canon 60D QC issues or exchanges: none. Zero. (But perhaps Canon customers aren’t so picky…! Who knows.) And for their report on repairs and customer service for Canon and Nikon in general: Repairs with Nikon cameras is a daily, ongoing issue. They see Nikons come back, both new and older models, and it sometimes takes sending the camera / lens / flash 3 or 4 times to Nikon to resolve the problem or the customer gives up by then. A few Canon models come in for repair, typically 4-6 year old heavily used Rebels that stop functioning properly. Canon repair is reported as excellent, customer service incredibly helpful, and turnaround is quick. Pile of brand new, defective Nikons returned over two month period: 15. Number of defective Canons: 0. Please note, this is the store’s report, not my opinion or bias, but I think it is worth taking this into account when choosing a dSLR system. edit 2011-09-29: When any new camera comes out, there is an outcry of “this problem” and “that problem.” Some are exaggerated because you only read about the few bad ones and not the tens of thousands of good ones. Some are possibly over-reactions by people not fully understanding the new or advanced features or nuances of the latest model. But I wanted to speak from personal experience while working at a camera store and comment on the issues that were being discussed in forums which proved to be real. The scope of the issues in the overall picture (of tens or hundreds of thousands of bodies made), however, should be taken into account, as well as the fact that the returns and exchanges may have been prompted in whole or in part by the internet reports, thus creating a circular chain of whatnot (I’m sure there is a term for this!). Know that C and N are reputable companies and will make right any genuine issue you may encounter (within your warranty period!). And while it is frustrating if you encounter a bad pixel, I think it is a marvel of technology that any sensor can be manufactured with 16 million pixels that all work! Conclusion: Hey look! They are incredibly similar! (other than quality control issues) Both are capable of taking high quality digital images. They are both leaps and bounds better – and cheaper – than the same level dSLRs of just a few years ago. I do like the specifications of the expanded autofocus system, the slightly better sensor performance, the larger viewfinder, the custom setting options, and the partial magnesium alloy body construction of the D7000. Yet the 60D has the additional HD video frame rates, 9 out of 9 cross type AF points, and the articulating screen. You pay a few hundred dollars more for the Nikon, and you get a camera with body construction and features that are a bit better than the 60D. However, if you don’t actually need, understand, or wish to learn how to use all these additional features of the D7000, there is no point in paying for them. (If you are going to leave the camera in Auto or Program mode and let the camera choose the autofocus points, you definitely don’t need a D7000!) In the end, it totally comes down to which one you are more comfortable with – which one feels better, which one’s buttons and controls work best for the way you work, which one’s menus make better sense to you, which one’s custom functions allow you to make the customizations you want to make, and how much money you want to spend. Or which system you want to invest in for the long-term, as far as all the lenses, flash, and accessories you are going to accumulate. Or which camera brand your friends use so that you can go to them for help. Just choose one, learn to use it well, and get out and take photos! That’s what digital SLRs are all about. Canon didn’t drop the ball with the xxD line, as some have said. It’s just that they reconfigured their price points and naming conventions. The 7D replaced the 50D months ago, and it was widely agreed to be a dramatic, spectacular, and successful improvement. That was very much like the Nikon D90 to D7000 improvement we see now. Canon definitely took the 50D to the next level with the 7D. But then they needed a high-end consumer model to offer between the entry level Rebel line and the semi-pro 7D. Hence the highly capable 60D. So who wins? The consumer. The digital photographer. Cheesy, but true. If you wish to compare the Nikon D7000 vs the Nikon D90 vs the D300s, have a look at this post. Purchasing? 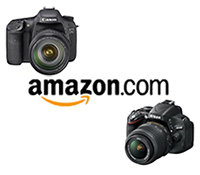 If you are planning to buy either of these cameras from Amazon.com (or other equipment, accessories, or simply anything else), please use the links below and I will get a little something for referring you, which will help support my blog. Thanks! If you wish to purchase from B&H Photo, Adorama, or direct from Canon, please click on their logos on the Gear page. Thanks!